A federal judge has ordered Morgan Stanley to give subpoenaed documents to E*Trade Financial Corporation, an online discount brokerage, by Feb. 22. The judge issued the order in a pending case filed by E*Trade against a former employee, a corporate services financial consultant who bolted several months ago to work at Morgan Stanley. 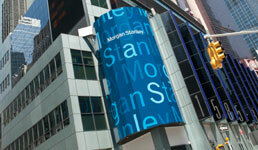 “There is lots of risk for Morgan Stanley,” Thomas Lewis, an attorney at Lawrenceville, N.J.-based firm Stevens & Lee, who represents both financial advisors and their employers, says about the development in the case. The case is notable because of the rarity of a discount brokerage pursuing a traditional counterpart, Lewis says. “We have an online discount brokerage going to battle with one of the giants in the industry. E*Trade is sending a message — don’t’ take our people. It will have a chilling effect,” he adds. With its lawsuit, filed in a federal court in San Jose, Calif., E*trade seeks a court injunction to stop Julius Agbonbhase, its former consultant who was based in Cupertino, Calif., from allegedly using its confidential information to solicit its clients to join him at Morgan Stanley. E*trade has also initiated a Finra arbitration proceeding against Aghbonbhase. The federal lawsuit solely focuses on obtaining an injunction. But according to Lewis, the federal lawsuit also will help E*Trade glean more potentially damaging information from Morgan Stanley than the discount online brokerage would otherwise find possible if it had only proceeded with its Finra complaint. The federal judge’s order calling for Morgan Stanley to give E*Trade documents might lead to depositions of the traditional wirehouse’s executives, Lewis says. E*Trade will then potentially introduce those documents and deposition transcripts at its Finra hearing and even use them to justify adding Morgan Stanley to its Finra complaint. “It’s really easy for E*Trade to amend its statement of claim,” Lewis says. In its lawsuit, E*Trade argues that most of its more than 6.6 million account holders never speak to an individual financial advisor. “Historically, E*Trade has attracted clients through extensively and costly advertising campaigns in various media outlets,” the lawsuit states. Agbonbhase, who signed a confidentiality agreement, had access to E*Trade’s brokerage clients, the lawsuit alleges. And while E*Trade had assigned Agbonbhase the task of managing those client relationships, he was not responsible for soliciting them, the lawsuit alleges. Thus Agbonbhase cannot claim ownership of the clients, E*Trade argues. In a Nov. 16, 2018 resignation letter, Agbonbhase told E*Trade management he was exiting immediately, going to work for Morgan Stnaley, and did “not possess any originals or copies of E*Trade proprietary documents,” according to the lawsuit. But the lawsuit alleges Agbonbhase used E*Trade’s confidential information — including client contact information, pricing arrangements, investment preferences, risk tolerances, and trading or account histories -- in a campaign to solicit them to hire Morgan Stanley. In the months before he quit, Agbonbhase set up meetings with E*Trade clients on behalf of Morgan Stanley, the lawsuit alleges. His use of E*Trade networks, his phone records, and his expense reports reflect a pattern of such a campaign late last year, the lawsuit alleges. Rodney Sorenson of San Francisco’s Payne & Fears, who represents E*Trade, did not return a call for this story. Nor did Harold Andrew Bridges of Redondo Beach, Calif.’s Bridges & Bridges, who is defending Agbonbhase. A spokesperson for Morgan Stanley declined to comment.